It’s winter, I know right. Thoughts of the beach are forever and a day away from the forefront of our minds. Heck, didn’t some ground hog just see its shadow recently? This is why, when I was searching for something to examine I thought it a bit weird that I opened the story that I did. I go through this round about search all the time. I spend so much time examining different bits of story only to get side tracked when it comes to get some thoughts together about what I have been exploring. And then I get to where I want to write some thoughts down and everything I collected prior to the moment is completely gone from my mind. Yeah, this is where I found myself when I sat at the keyboard this time. I ended up pulling a book off the shelf and thumbing through the table of contents. Found this story, The Toll, written by Paul Walther. 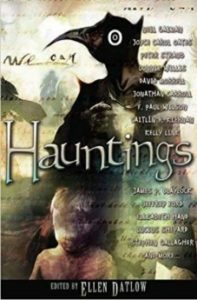 I pulled from the anthology Hauntings (Tachyon 2013) edited by Ellen Datlow. Wouldn’t you know this is a beach story at the end of summer. The main characters are, of course, life guards. So for a simple thought of it all, we are stuck in a winter with no end in site and I am digging through a story about the end of summer. None of this really makes sense. At least if you want it to mesh in some metaphysical way or something. Instead we are probably more likely to look at it as a luck of the draw kind of thing because I picked it at random from the book. Mind you, all of this information is neither here nor there and I am actually just stalling for time. See, it wasn’t until I figured out a title for this piece that I actually caught a more important part of the metaphor of the story itself. (mind you I am pulling stuff out my heiny on this one because I am trying to sound all smart and stuff). But that’s the thing, right? When we take the story at face value, we see one of the characters as the guardian of summer. Even as he has aged he still maintains the semblance of what summer is about in a beach town. As a season he isn’t seen as a malevolent force, at least not at first. But just as we fall deep into the dog days of summer, he changes as well. His age shows the closer you are to him, the better you know him. And this is what drew me into the story without even realizing it. Sure there is all this surface weirdness to it. We are introduced to Bohanan as a person through Mary’s eyes. There are some vague oddities that she remembers from her mother’s stories about him. But all of it is surface thoughts and feelings. Through out the story we are given just tidbits that allow us to see a little more of what is going on. But even then our thoughts are of a human monster, something that we can grasp and understand. Because this is what’s at the surface, just like the lake in the story. Everything we see is a reflection of what we expect to see. Like I said, it didn’t strike me what happened till after I had created my own title for this piece. Sure I knew the surface of everything. That was something you can’t mistake. But it my subconscious had some deeper thoughts about the whole thing. Which brings me to a deeper question to ponder for it all. If the summer takes a toll, what happens on the years when it doesn’t get what it needs? Sure, there was an answer of sorts in this one. But that doesn’t mean that summer always wins. Anyway, I realize I am speaking in a bit of vagaries now, but its mostly to not give everything away about the story. Mind you, I am sure I have given too much away as it is. But this is horror where people are meant to die. It serves the story. The question is, how bloody might it be (not as much as you’d expect). It was an interesting story. The more I sit and think about it, the better it gets. Check it out if you ever run across it. 2 Responses to "Summer’s Toll #reflection"
You might be stuck in a winter with no end in sight in Michigan, but in my neck of the woods it was 62 degrees yesterday. Strange indeed, especially after last winter being the snowiest one on record in the Boise area. January was an odd one this winter. We had a couple days in the high 50s and maybe low 60s. And then winter would remind us it still exists. And then there was yesterday when I had to get the snowblower out to clear the driveway.